IT'S NOT surprising that Brett Spencer remembers well Davros, his Daleks, the Cybermen and the Master, (Young Guardian, September 9). These Dr Who enemies all appeared with Colin Baker in 1985. This was a generally impressive season but "behind-the-sofa stuff" in terms of violence and gore. 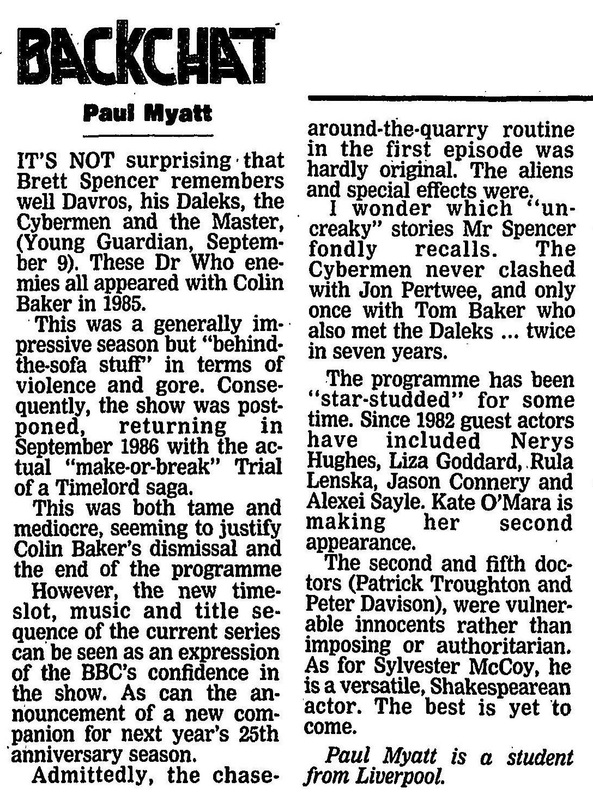 Consequently, the show was postponed, returning in September 1986 with the actual "make-or-break" Trial of a Timelord saga. However, the new time-slot, music and title sequence of the current series can be seen as an expression of the BBC's confidence in the show. As can the announcement of a new companion for next year's 25th anniversary season. Admittedly, the chase-around-the-quarry routine in the first episode was hardly original. The aliens and special effects were. I wonder which 'un-creaky" stories Mr Spencer fondly recalls. The Cybermen never clashed with Jon Pertwee, and only once with Tom Baker who also met the Daleks ... twice in seven years. The programme has been "star-studded" for some time. Since 1982 guest actors have included Nerys Hughes, Liza Goddard, Rula Lenska, Jason Connery and Alexei Sayle. Kate O'Mara is making her second appearance. The second and fifth doctors (Patrick Troughton and Peter Davison), were vulnerable innocents rather than imposing or authoritarian. As for Sylvester McCoy, he is a versatile, Shakespearean actor. The best is yet to come. Paul Myatt is a student from Liverpool. APA 6th ed. : Myatt, Paul (1987-09-16). Backchat (The Guardian). The Guardian p. 12. MLA 7th ed. : Myatt, Paul. "Backchat (The Guardian)." The Guardian [add city] 1987-09-16, 12. Print. Turabian: Myatt, Paul. "Backchat (The Guardian)." The Guardian, 1987-09-16, section, 12 edition. This page was last modified on 30 April 2015, at 21:19.